Hello there, Beastiebuddies, and happy Friday! 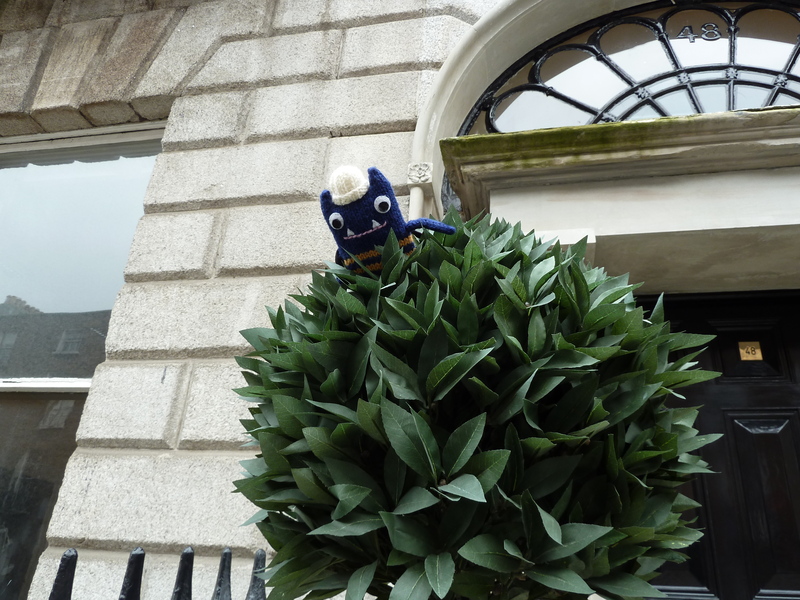 Today, Explorer Beastie and I want to take you to another part of Dublin you may not have seen before. Come and join us as we wander down the side of Merrion Square, and head towards the Grand Canal! Around here, you can see some great examples of Georgian townhouses – a style of architecture which still dominates large areas of Dublin’s city centre, both north and south of the river. The first “Georgian-style” buildings date back to the 1720s, when many of Dublin’s narrow mediaeval streets were widened, and a property boom encouraged developers to build new houses on what were then the very edges of the city. It’s strange to think that what I consider to be the heart of Dublin was once almost the countryside! … Or an elaborate iron boot scraper! And of course there’s a prize if you spot a house with a famous former resident! You can also find out more about what life was like inside these houses a little further down the street, at Number Twenty Nine – a faithfully restored Georgian-style house, which is open to visitors all year round. We didn’t go inside this time, but we’ve been before and it’s definitely worth a look! …And then carried on to find one of Dublin’s lesser-known landmarks – St Stephen’s Church, affectionately known to Dubliners as “The Pepper Canister”! … Before heading back home! I wonder where Explorer Beastie will pop up next? Tune in next week to find out! What a clever little way to make the area interesting. Thanks for taking us on your travels. those doors have always captured my interest with their bright colors and interesting knockers. Thanks for that architecture tour. I have sadly never been to Dublin (but would love to go some time, especially since I am a Joyce fan) but several of your photos made me think of Edinburgh and its rows of Georgian properties in grey northern light. That’s something I’ve always wanted to do actually. Maybe some day when I’m back visiting family in England and Scotland I can hop over to Ireland. My friends and I had a plan to visit Dublin for a long weekend but then I emigrated. We met in Manhattan instead. The boot scraper is amazing. Such detail! Did Explorer Beastie notice if they were all the same or were there different styles?Dublin looks really interesting, well worth a visit. Thanks for sharing it with us. You’re welcome! There did seem to be a few different designs of boot scrapers along the way, although unfortunately I only photographed Explorer Beastie cleaning his paws on one of them! A lot of smaller houses in other parts of the city have these outside too, but they’re much less fancy. Makes you wonder what the streets were like in those days! Definitely! They do guided tours if you like, or you can wander around by yourself. I’ve always loved these buildings, and I think it’s great that so many of them have survived into this century… Apparently we went through a bit of a phase of demolishing them in the 1950s and 60s! I know! Turns out that sometimes it’s better (in the long term) for the government to be a bit strapped for cash! I see a new marketing opportunity/knitting project…Beastie Door Knocker decorations! Well, Portland could use a bit of “un-weirding” but some Beastie bombing would be perfect. And they’d feel right at home with the weather we’re having.